LIC Aadhar Stambh T-843 is a new plan offered by Life Insurance Corporation of India exclusively for male lives who own an Aadhar Card issued by UIDAI. LIC’s Aadhar Stambh plan is a non-linked, with profits, regular premium endowment assurance plan. The plan becomes attractive with low premium, Accident and Disability Benefit, loyalty addition (along with maturity) etc. This plan is available for standard healthy female lives with out any medical examination. 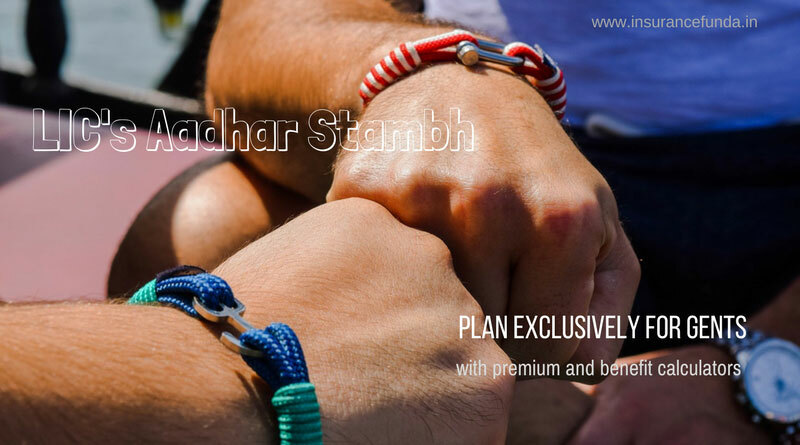 This article provides you complete information on premium and all available benefits of LIC Aadhar Stambh Plan, with illustrations and calculators. LIC has also introduced a similar plan exclusively for females with the name LIC Aadhar Shila (T-844). Read more on the complete details of LIC Aadhar Shila. LIC Aadhar Stambh – Calculator is a powerful online calculator to provide complete idea on premium, maturity and insurance coverage benefits, in a simple and user-friendly manner. Riders such as Accident and Disability Benefit (DAB) has been incorporated in to this calculator. LIC Aadhar Stambh is an Endowment type of policy, where the maturity is given as a single lump sum payment after completion of the term. Maturity amount of LIC Aadhar Stambh is the total of Sum Assured plus Loyalty Addition(if any). Normal insurance coverage will be equal to basic Sum Assured but Loyalty Addition will be paid additionally if death occurs after 5 years. Additional accident coverage equal to basic sum assured and extended permanent disability benefit is available under the plan as a rider. Critical Illness Benefit is not available under this plan. Loan is available after the completion of three years. Maturity value of the LIC Aadhar Stambh plan is full exempted from income tax u/s 10(10d) of Income Tax Act. Read more on the Income Tax rules applicable for insurance policies. In order to get a clear idea on the benefits of LIC Aadhar Stambh policy, let us take an example of a person with following details and assume that he is taking a new policy. The maturity amount of the policy includes Sum Assured along with loyalty addition (if any ) declared by Life Insurance Corporation of India from time to time. If the death occurs before completion of five years, nominee will be eligible for ‘Sum Assured on Death’ only. Where Sum assured on death is defined as the higher of 10 times of annualised premium or basic sum assured. If the death occurs after completion of 5 years ‘Sum Assured at Death’ plus loyalty addition available as per the year of completion of the policy will be paid to the nominee. Where Sum assured on death is defined as the higher of 10 times of annualised premium or basic sum assured. The table provided here will help you to get a clear idea on the insurance coverage available on various years. LIC Policy revival and late fee online calculator. LIC New Jeevan Anand (T 815)- Details with premium and maturity calculators. Easy Underwriter-Medical and financial online underwriting guide and calculator. Income Tax Calculator- FY – 2017-18. LIC’s Jeevan Anand – a critical review. Ulip vs- every thing you should know. Ulip vs Mutual fund – which is better. Top insurance companies based on claim settlement. *Benefit Illustrations provided here to provide some information on the plan and is not an exhaustive document. Please read the documents provided at LIC web site for more information. In Aadhar Stambh plan The maturity amount includes Sum Assured + Loyalty addition. But LIC has not yet declared the loyalty addition rates. So we cannot predict the maturity amount now.